The entire experience was great and handled all electronically which is most convenient. My Husband and I decided to spend out honeymoon here. I am at a loss of words for how gorgeous this cabin is. I don't want to leave. Can't wait to come back. Our entire stay was great. the cabin was clean and roomy. It definitely met our expectations. We would stay again. Made such great memories here! Absolutely enjoyed every minute of this trip with my boyfrien. We can't wait to come back. We love the Smokies. Here for a birthday. Everything was awesome, we really enjoyed our stay at Bear Moon Lodge. We will be back. Thank you for sharing your beautiful cabin with us. We had a wonderful time. Everything was just perfect. Thank you again. Made such great memories here! Absolutely enjoyed every minute of this trip with my boyfriend. We can't wait to come back. We love the Smokies. Very professional and efficient, as usual. Love the Cabin and the porch! The rocking chairs were awesome. Those plus the leather couches amazing!!!! THe cabin was beautiful the amenities are amazing and the cabin is super clean. This is our 6th time staying here for our annual trip together and can't beat this view! We love relaxing together and celebrating friends since 2001! See ya next time. This was probably the best rental we have ever been at! Very well taken care of a nice. 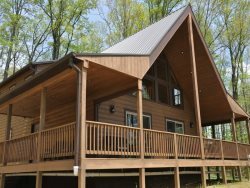 Care seems to be the forefront or the owners of this cabin. We had a blast. My Family and I decided to take a last min short stay in the mountains and we were lucky enough to book this beautiful cozy cabin. We were delighted by it. Such a lovely time was had by all. The cabin was decorated so nicely and we felt at home. THank you for keeping you cabin in suce impeccable shape. As well as so clean. We will be back. Thank you guys for having us at your beautiful cabin. we enjoyed the bike trails and had rode horses. There is a lot to do in this area for kids. I look forward to coming back soon. This was a great escape from the daily doldrum of life in Charlotte. Loved the cabin and view. It was a great weekend away and I am looking forward to coming back. Thank you so much for sharing your cabin with us. It is a very comfortable place. We love the area, close to all we wanted to see and do. Hope to be back one day soon. Thank you for much or sharing your cabin with us. It is a very comfortable place. We love the area close to all we wanted to see and do hope to be back soon.